NEWS: Charles Gavan Duffy, politician, barrister, author and publisher was born on Monaghan Town on April 12th 1816. ​We've just had a birthday party in the Westenra Arms Hotel, Monaghan - presentations, ballads, music and poetry. ​Thank you to all who helped and attended. Charles Gavan Duffy was born April 12, 1916, 200 years ago, barrister, journalist and politician, he was a Young Irelander who founded "The Nation" with Thomas Davis and John Blake Dillon in 1842. Sir Charles Gavan Duffy (1816-1903), Young Irelander, politician, statesman, and author. ​Born in Dublin Street, Monaghan Town, of a middle class family, he was educated in Belfast, 1839-40. 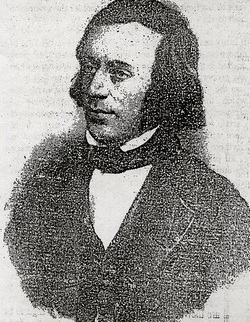 Duffy became a journalist with the Dublin Morning Register in 1836, and editor of the Belfast Vindicator in 1839. He was proprietor and editor of The Nation, which he founded with Thomas Davis and John Blake Dillon in 1842. In 1843 he issued The Spirit of the Nation, and then edited a further volume called The Ballad Poetry of Ireland (1845). He was imprisoned for sedition in 1844, and in 1846 joined Young Ireland's secession from the Repeal Association. Despite his initial caution, the revolution and the threat of coercion led him to support a rising in 1848. He was imprisoned until April 1849, after which he revived the Nation and devoted his attention to land reform and the Tenant Rights League. He was MP for New Ross 1852-5. Disillusioned with Irish politics following the collapse of the Independent Irish Party, Duffy emigrated to Victoria in 1855 where he practicised law and rose to be prime minister in 1871-2 and speaker of the Assembly in 1876-80, receiving a knighthood in 1873. He subsequently retired to Nice, France to write his extremely influential memoirs and historical accounts of the 1840s and 1850s. He also served as first President of the Irish Literary Society in London, 1892. During Heritage Week 2010 members of Monaghan Tidy Towns saw an opportunity to brighten up an empty shop front on Dublin Street while honouring an historic Monaghan born figure in Sir Charles Gavan Duffy. We would like to thank Monaghan County Museum and Mr Theo Mc Mahon for their input into this project. If you have any memorabilia or documents relating to Sir Charles Gavan Duffy and you would like to share them we would love to hear from you! Sadly the shop window is no longer available to us but we are working on a new display for CGD at the moment. A great great grandson of Charles Gavan Duffy living in Melbourne, Australia came across this web site and contacted us recently. Wayne R Makin is Grandson of Edith Dufray Duffy, who is the daughter of James Gavan Duffy, who is the son of Charles Gavan Duffy. He lives in Victoria Australia where Sir Charles Gavan Duffy was once Premier. We are delighted that he has offered to help with research on CGD and his life in Australia. Duffy's childrenn included his eldest son John Gavan; of the children of Duffy's second wife, Sir Frank Gavan (1852-1936) became chief justice of Australia, Charles Gavan (1855-1932) was clerk of the House of Representatives in 1901-17 and of the Senate in 1917-20, Philip was a surveyor and civil engineer noted for his work in Western Australia on the Coolgardie water supply, and Susan was gifted as a writer. The children of his third marriage were George, president of the Irish High Court, Bryan, a Jesuit educationist in South Africa, Thomas, a missionary in India, and Louise, M.A., who was given an honorary doctorate by the National University of Ireland for her work in education.